The following is an analysis of Global Industrial Manufacturing deals with disclosed value greater than $50 million. Global Industrial Manufacturing M&A deal value for the first nine months of 2016 decreased 10% compared to the first nine months of 2015. This was driven by a 22% decrease in volume period over period. When comparing Q3 2016 vs. Q2 2016 there was double digit growth in both deal value and volume. The current quarter was highlighted by 58 deals announced with a total disclosed value of $20.3 billion compared to 49 deals announced with total disclosed value of $12.3 billion in Q2, resulting in an 18% and 65% increase, respectively. The largest deal announced in Q3 2016 was the deal between Emerson and Pentair PLC-Valves & Controls Business ($3.2 billion). In Q3 2016, financial investor participation rates decreased to levels not seen since late 2013, with a deal value participation rate of 17% and deal volume participation rate of 21%. The improvement in deal activity in Q3 2016 may be a sign that deal makers’ economic and geopolitical concerns, both in the US and globally, have begun to subside. We are cautiously optimistic that Q4 2016 and fiscal 2017 will continue to be a good environment for deal makers. • Deal value for the first nine months of 2016 vs. the same period of 2015 was $64.8 billion and $72.4 billion, respectively, a 10% decline. 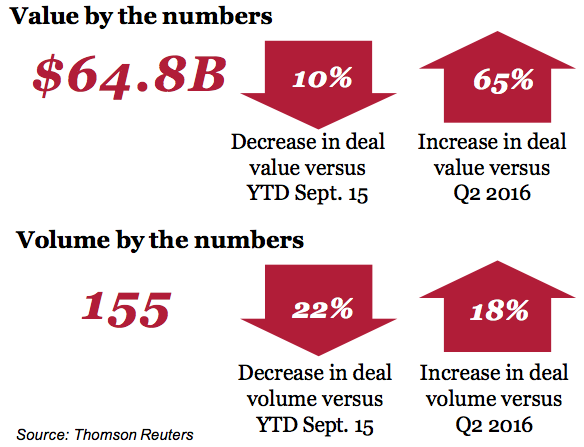 • Deal volume for the first nine months of 2016 saw 155 deals compared to 199 in the same period of 2015, a 22% decline. • Deal value increased in Q3 2016 to $20.3 billion, a 65% increase from Q2 2016. • There were five large deals ($1 to $5 billion) in Q3 2016 with total aggregate deal value of $9.9 billion, representing 45% of total deal value for the period. • Q3 2016 deal activity was highlighted by the Emerson Electrics’ acquisition of Pentair PLC-Valves & Controls Business ($3.2 billion) and Gree Electric Appliances’ acquisition of Zhuhai Yinlong Energy ($2.4 billion). • For Q3 2016 Industrial Machinery and Fabricated Metal Products sub-sectors continue to account for the bulk of total deal value with $6.8 billion and $4.4 billion of deal value, respectively. • Deal activity in Q3 2016 was dominated by strategic investors, as they drove 83% and 79% of transactions in both deal value and volume, respectively. Q3 2016 saw an increase in deal activity as compared to Q2 2016. Deal value in the quarter was $20.3 billion, a 65% increase from Q2 2016. There were 58 deals with disclosed value greater than $50 million announced in Q3 2016—an increase of 18% from Q2 2016. There were no megadeals in Q3 2016. For the first nine months of 2016 there was one megadeal for $22.7 billion between Johnson Controls Inc. (JCI) and Tyco International (TYCO). Compared to the same nine months of 2015, megadeal value has increased 20% (two megadeals with aggregate disclosed value of $18.9 billion). In August, Emerson Electric (US factory automation equipment producer) entered into an agreement to acquire the valves and controls unit of Pentair PLC-Valves (Swiss pump manufacturer) for $3.15 billion. The transaction is a part of Emerson’s strategy to expand its automation offering. Industrial Machinery, the largest category by deal volume and value, saw a slight decline in deal value from Q2 2016 ($6.8 billion vs. $7.5 billion), while all other major sub-sector categories saw deal value at levels not seen since Q4 2015. 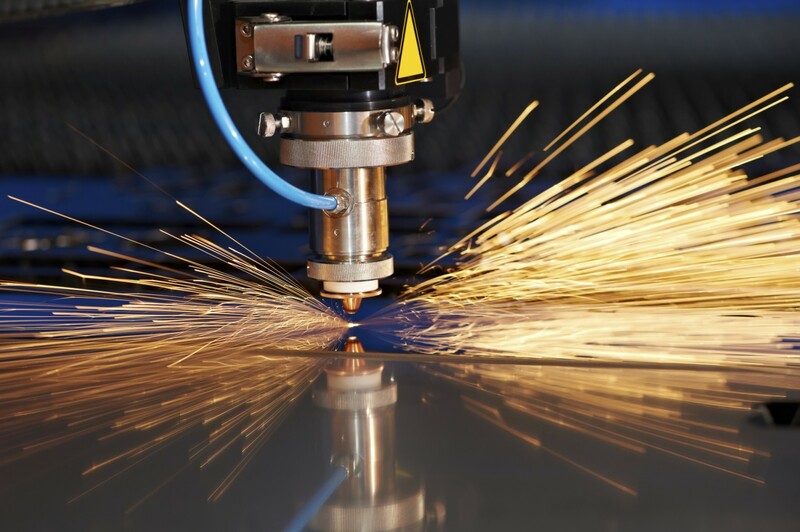 Fabricated Metal Products grew three times to $4.4 billion from Q2 2016 ($1.0 billion), which was primarily driven by the large deal between Emerson Electric and Pentair. Electronic & Electrical Equipment deal value for Q3 2016 was $5.9 billion, up from $2.1 billion in Q2 2016. 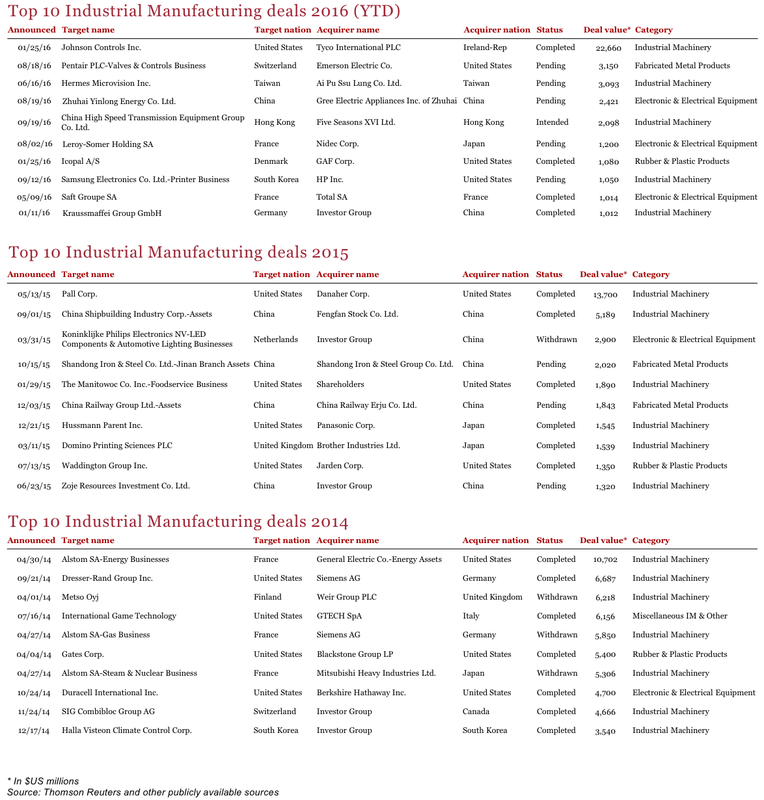 Strategic investors continue to account for the majority of deals in Industrial Manufacturing. In Q3 2016 the buyer group accounted for 83% of the total deal value and 79% of deal volume. Strategic investor deal activity in Q3 2016 surged to $16.8 billion and 46 deals while financial investors deal activity dropped both in terms of value and volume compared to Q2 2016. strategic investors continue to dominate the activity in the Industrial Manufacturing M&A market. 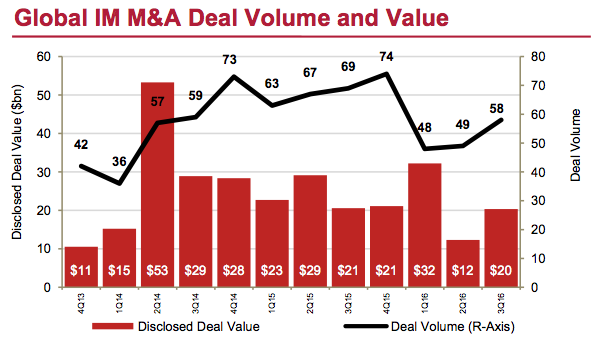 Local deals (transactions by targets and acquirers within the same borders) continue to account for the majority of M&A transactions, contributing to 65% of total deal value and 79% of total deal volume this quarter. Still, there appears to be growing interest in cross-border deals, as seen by the Emerson-Pentair deal which accounted for 15% of total deal value this quarter. Meanwhile, the majority of cross-border and local deals continue to be taking place in the Asia & Oceania region. Industrial Manufacturing has seen declines in deal value and volume for the first nine months of 2016. However, that trend changed in 3Q 2016. According to PwC’s 2016 CEO Survey, 28% of CEOs in the US and globally have a desire to complete a deal. Although the economic impact of geopolitical uncertainty in the US and globally will likely continue to be on the minds of many deals makers for the remainder of 2016, the improved deal activity in the current quarter may be a sign deal makers, in certain sectors, are more optimistic about the future. • Deal maker cautiousness will subside as outcome to geopolitical events and their potential impact on deal making becomes clearer. 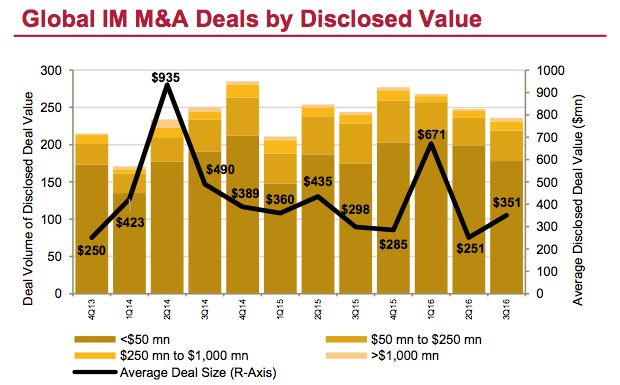 • Deal makers will continue to pursue less risky strategic alliances to expand market share and optimize value as an alternative to pure M&A plays. • Comparatively stronger US economy may lead to increased foreign investment and inbound deals to the North American region.